List of 2019 Camp Programs Now Available! 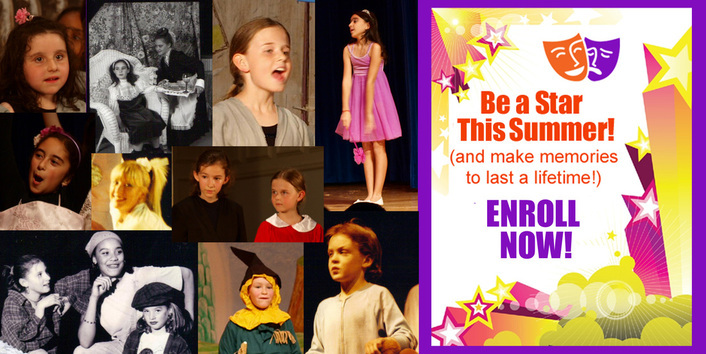 BE A STAR this summer in Drama Discovery's Summer Theater Camp! Our Drama Camp is fun, smart and educational! Children learn all about theater by putting on a new play each week they sign up! They make costumes, scenery, learn acting, signing, dancing! Make friends! Public speaking and performing! Overcome shyness! Teamwork! We offer therr age groups, a younger group (K-2), middle groug (3-4) and older group (grades 3-7). ​We do offer various discounts. Please call us or sign up for our newsletter (below) to learn about these and other special offers. A minimum of 10 campers is needed; if enrollment is less than 10, campers will join with the camp in close proximity, approximately 20 minutes from the original location. If there are less than 10 campers, the program may be canceled.